Think of DesignMatters TV as your personal online design school! 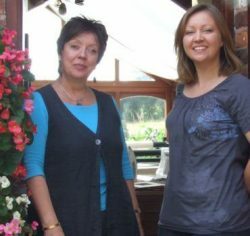 Presented by artists and experienced tutors, Linda and Laura Kemshall, DMTV is a vast library of video workshops covering subjects as wide ranging as altered books and watercolour painting to surface design, art quilting and sketchbooks. Discover the inspirational sources that Linda brought together in the making of her quilt 'Fractured'. Linda also discusses the techniques that she used in the making of the quilt. Enjoy video workshops from the Archive Collections or sign up and become a Member to enjoy the newest content as soon as it’s released. Love DMTV workshops? Get both! Join DesignMattersTV and enjoy a changing playlist of the latest video workshops. You’ll always have access to 30+ videos with a new one added each week. * ‘lifetime access’ – the lifetime of us, you or DMTV.